Axis Theatre, 1 Sheridan Square, NYC. Honor (Katie Rose Summerfield) extends her hands, palms up, her eyes wide with hope. And when she hears the word "paradise," her face lights up with a gentle, hopeful madness. Honor is one of the six remaining settlers from the first Puritan colony in Massachusetts in "Strangers in the World," a new play by Randy Sharp. Distance, Coldweather, Killsin and Constance are her companions. The colony is still suffering from the loss of neighbors and family – all the children are dead; attacks by Native Americans, starvation, and the bitter cold after their houses were destroyed. They have 23 apples left. The many dark trees that form a pattern of crisscrossing shadows on the stage of Axis Theatre (Chad Yarborough, designer) are as ominous as the eerie music composed by Paul Carbonara. 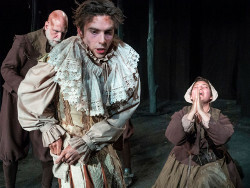 The play opens with a man kneeling on the ground ("I will be as new") and segues to a debate: should they travel south to a city that may or may not exist or wait for a ship from England to bring needed supplies. Randy Sharp, the Artistic Director of Axis Theatre, which is celebrating its 20th anniversary, chose this unlikely bit of American history to create a moving, stylized theatre piece. Even as phrases and gestures crisscross and repeat, something new is added, sparking our attention and adding to the conflicts on stage. First a stranger (Phil Gillen) arrives, clad not in Puritan homespun (Karl Ruckdeschel, designer) but in 17th century European high style with lace and rich fabric. He is a bizarre figure. He alternates promises of the salvation of the ship (which no one can see) with the refusal of aid because they are not a godly people. He is clearly afraid yet even when they cage him, he asserts verbal dominance. He says he has caught them in ungodly dance; they have failed to follow god's mandate and increase the flock. There are some funny yet bizarre moments when he convinces them to touch each other – man to woman, man to man – and everyone is embarrassed. We hear some strange, unclear confessions about adultery and child abuse. And then Jane (Britt Genelin) appears, a long lost wife. Her face is "painted," probably tattooed by Native Americans. She urges them to follow her to paradise in the woods. Honor's face lights up on hearing the word "paradise," and we realize she does not understand much beyond the dream. Perhaps she is an indicator for all. With a third choice they are paralyzed. Should they march south, should they wait for the ship, should they enter the woods? Are they hallucinating these visitors? The acting is exceptional. Each character is individualized by gesture and tone. Their dilemma is poignant, and the repeating phrases are almost incantatory. As school children, we are taught to celebrate the brave Pilgrims who arrived in 1620 to established a stable settlement in Massachusetts. (The infamous witch trials were later, 1692-3, and maybe caused by ergot poisoning.) But the historical facts of the first colony are darker. After a difficult voyage that included a sailor mutiny, storms, disease, and the main mast cracking, the small group of believers landed in New England, not Virginia, which was their destination, in the winter, not summer when they could still plant the fields. It took them days to find fresh water. There was danger from wild animals, no shelter, hostile Native Americans, and perpetual cold. Half of them died, which challenged not just their emotional balance but the faith that drove them to find a new land. They believed they were God's elect, specially protected if they fulfilled the mandate to work hard (the Puritan Ethic) and multiply. "Strangers in the World" makes these people feel contemporary as they struggle with forbidden urges and the desperate longing to be perceived as worthy of grace, blessing, and salvation.